This might sound stupid – and that’s mainly because it is – but the reason I tried this recipe is simply so that I could chop up a whole chicken with a massive cleaver. I’ve spent years in fear of dinging the edge of my ridiculously expensive German knives doing something as mundane as jointing a chicken, and I’ve learnt to dissect poultry with a surgeon-like precision using nothing but a sharp two-inch blade. That tiny knife won’t get through a breast bone, though, so recently I’ve taken to using a pair of scissors for that. Scissors from Staples. Scissors meant for cutting pieces of paper, not chicken bones. The cleaver changed all that. It’s a fearsome sight, sat up there on my knife rack, dwarfing every other knife in sight. If it ever accidentally fell off, it’d probably smash a floor tile on impact, after taking somebody’s leg off on the way down. It makes short work of a chicken, and at less than a tenner, I’m not afraid to wield it with some force to get the job done. It’s primitively satisfying, and worth the space on the knife rack. If you want one, go to a Chinese supermarket. So, a typical, everyday Spanish chicken dish originating in the mountain range that runs parallel to the Santander coast. It’s rustic and wholesome food, with a beautiful little twist right at the end that elevates the taste to a different place altogether. Chop up a big chicken, about a kilo in weight into large serving pieces. There are many ways to do this, but I favour removing the chicken’s back so that it can be used to make a quick stock for later in the recipe – nothing complicated … just the waste chicken bones and skin, chopped up into smallish pieces and simmered with a carrot and an onion. A whole chicken gives you this gift of fresh stock. A tray of pre-packed pieces doesn’t, and costs you more. Take the skin off the chicken pieces, and chop the tips from the wings, and add all this to the stock pot, then fry each of the chicken pieces in a large pan with some lard. Lard can take the heat well without burning, so keep the temperature constant and brown the chicken pieces quickly and evenly. Once browned, set the chicken aside and fry two sliced onions and 120g of diced streaky bacon in the same pan, until the onions are soft and the bacon fat is starting to run. Add four cloves of crushed garlic and two red peppers, seeded and chopped up into small pieces. Cook for five minutes or so, then add four skinned and chopped tomatoes and about 900g of potatoes, peeled and cut into large chunks. A waxy variety is best, so that the potatoes hold their shape in the pan without disintegrating into a mush. Now for the Spanish touch. Two teaspoons. In the pan. A couple of bay leaves would be good, as well. Season with salt and pepper at this point, as well. After another five minutes of gentle cooking, the onions and pepper should be starting to melt and caramelise a little in the bacon fat, and everything will have a spicy red sheen from the paprika. Tip the chicken back into the pan and pour over 300ml of white wine and top the pan up with chicken stock so that everything is scarcely covered. Put a lid on, turn the heat right down and cook for half an hour. Once the chicken is cooked through and tender – it might need a little longer – fish it out of the stew and collect it in a warm serving bowl, then crank up the heat under the pan to reduce the remaining sauce until it reaches a pleasingly thick consistency. Take care not to overcook the potatoes. 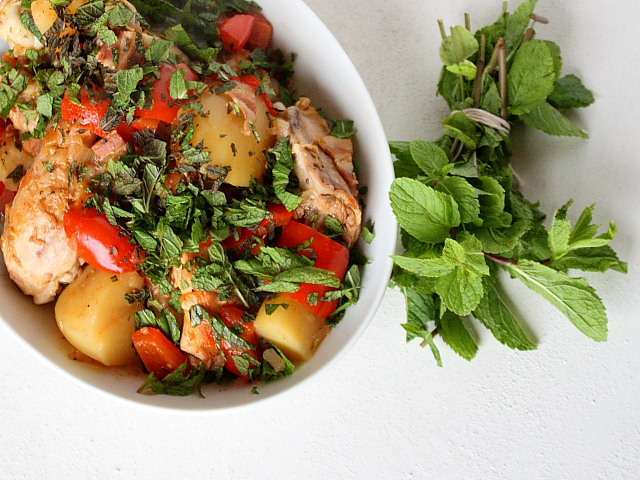 Spoon the sauce, potatoes and all over the chicken in the serving dish and finish with a big handful of chopped fresh mint leaves. The mint is important. It moves the whole flavour of the dish, changing it from a fairly mundane chicken stew with vague Spanish overtones into something extraordinarily good. The mint really is transformative, and it adds a whole new dimension as it wilts and blackens in the heat of the chicken stew, melting into the sauce. This is one pot cooking at its best. You need nothing more, besides chilled white wine. Looks delicious. Will give it a try. Not sure about the quality of string on that bunch of mint though.